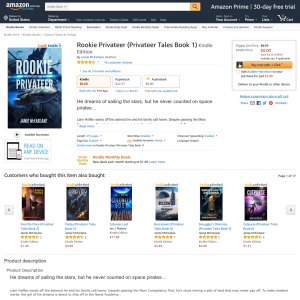 Rookie Privateer is the first book in the Privateer Tales saga, a series of swashbuckling space operas. If you like memorable and witty characters, pulse-pounding adventures, and galactic tales reminiscent of golden age sci-fi, then you’ll love Jamie McFarlane’s explosive tale. Buy Rookie Privateer to ship off on a wild ride today!